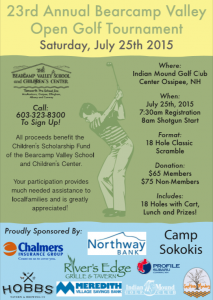 Registration is now open for the 23rd Annual Bearcamp Valley Open Golf Tournament! 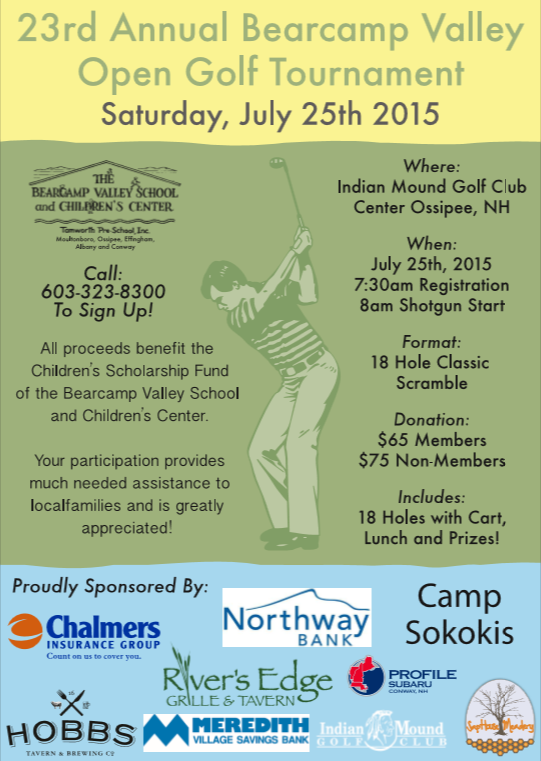 Join us on Saturday July 25th, at Indian Mound Golf Course in Ossipee, NH for an 18 hole classic scramble! Teams of four will enjoy a great day of golf, followed by a luncheon, awards, & silent auction! Thank you for making the 22nd Taste of the Valley a HUGE success! Thank you to everyone who came to Hobb’s Tavern & Brewing Co., on Sunday June 7th for our 22nd Annual Taste of the Valley Food Festival. We had over 200 people join us for this wonderful dinner. A very special thank you to all of the participating restaurants, and volunteers who made this all possible. Hope to see you again next year! Restaurants/Organizations Featured: The Yankee Smokehouse, Hobb’s Tavern & Brewing Co., Jake’s Seafood & Grill, Cafe Noche, The Chequers Villa, Jonathan’s Seafood, Bearcamp Cafe, Subway, Sunnyfield Brick Oven Bakery, the Scandinavian Bakery, the Daley Cafe, the Tamworth Camping Area, and the Whittier Lion’s Club. Thank you to our volunteers! Boy Scout Troop 151 – Cam, Garret t, James, David, Micah, Justin, Bob, Tim, and Dave. Girl Scouts Kimberly, Jessamine, Mackenzie, and Diane. Along with our Bearcamp Family volunteers: Board Members Kim, Ebony, and Nancy, Staff Mindy, Eileen, Nichole and Jen, students and families Kayley, Aidan, Carissa, Mackenzie, Kim, Angela, and more! Posted in Uncategorized	| Comments Off on Thank you for making the 22nd Taste of the Valley a HUGE success! The Bearcamp Valley School and Children’s Center is pleased to announce the 22nd Annual Taste of the Bearcamp Valley Food Festival. This is a major fundraising event for the center and one our community looks forward to each year. Please join us on Sunday, June 7 at the Hobbs Tavern as they host this delightful dinner featuring menu samples from a dozen local area restaurants. Because of the popularity of this event we will be offering two sittings, the first from 4:30 – 6:00 p.m., and the second seating from 6:00 – 7:30 p.m. The dinner is open to the public and tickets are available at the Bearcamp Valley School & Children’s Center, and also online. This is a great opportunity to enjoy a delicious dinner with family and friends while supporting the Bearcamp Valley School and Children’s Center, a non-profit child care and early education center. We are very excited to announce that the Tamworth Foundation has awarded Bearcamp Valley School & Children’s Center a grant to purchase an activity van for our students! We now have our very own, 10-passenger activity van to bring our children into the community to support and join local programs & explore the world around them on numerous different field trips. Our gratitude cannot be expressed enough for how much this means to us as a center, and to our students & families, currently & those in the future. We also would like to send out a most sincere thank you to the Gibson/Woodbury Charitable Foundation for awarding us a grant to cover the costs associated with our new beautiful bus that is now all ours. Posted in Uncategorized	| Comments Off on Thank you for making our dreams come true! Exciting News About Our Summer Program! Looking for something fun to do this summer with your children? How about enrolling them to Bearcamp Valley School & Children’s Center! Our staff is currently planning a fun-filled summer full of adventure and exploration for all ages. For our youngest explorers – we have some exciting news!! Due to growing enrollment, we will be opening a second toddler classroom for our youngest students (18 mons – 2 years) starting on our first day of summer program. While our toddler classroom currently is full, enrollment for the summer and fall programs is now open! Posted in Uncategorized	| Comments Off on Exciting News About Our Summer Program! Drop kids off before any of our programs and pick them up late in the afternoon. Parents of school age children who attend the K.A. Brett school in Tamworth can also take advantage of early drop off and late pick up. Students are safely walked to and from school.